A year or two ago, Isaac and a bunch of his buddies discovered hot peppers. They each grew various types and took them to school where they traded, challenged each other, did nerve damage to their tongues, etc…you know, guy stuff. 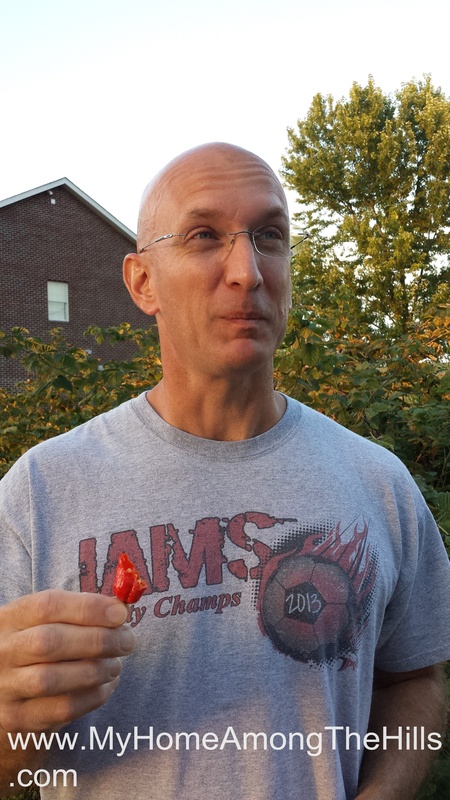 Most of the guys had run of the mill peppers…habaneros, thai chili, cayennes, etc. To be sure, there are some good and hot peppers in that bunch and they were a lot of fun. This year, we decided to step it up a bit and planted ghost peppers, also known as bhut jolokia peppers. In 2007, it was rated as the world’s hottest pepper…a mere 401.5 times hotter than Tabasco sauce. 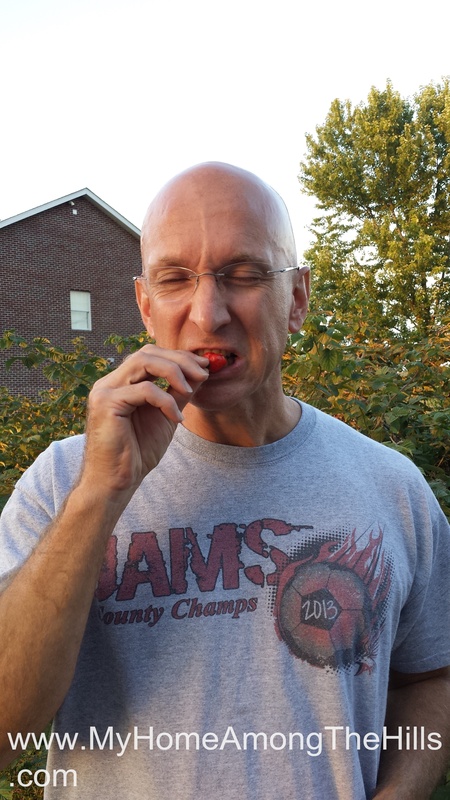 For reference, a jalapeno pepper registers between 1000 and 4000 Scoville units. A freakin’ ghost pepper rates at 1,000,000 (1 million) Scoville units! Anyhow, we grew a beautiful crop of ghost peppers this year. They grew nice tall plants and this week, started ripening into their beautiful red color. Isaac picked them on Sunday and ate the end off of one of them. We watched as his face turned red and he immediately had to get a tissue as his sinuses drained. He drank a ton of milk and had that goofy look on his face when you know you’ve made a mistake. Not to be out done, I decided to step it up a notch. I chomped the remaining pepper, including the seeds, and within 10 seconds, knew that I had really screwed up. It took no time for my sinuses to clear and then my lips and tongue felt as if they were swelling…I imagine they probably were. I could feel it down my throat and all throughout my mouth and nose (watch the video link). Finally, and this is the best part, within 3-5 minutes, I had to deliver my supper to the porcelain altar. Luckily, my mouth was so hot that I couldn’t taste a thing! So, if you find yourself in need of something stupid to do on a Sunday evening, find a ghost pepper and eat it all in one or two bites…it’s for the teenage boy in all of us! By the way, Isaac took a few to school to share with his buddies…sharing is a good thing, right? Anxious to hear how many people had to go to the hospital. Hopefully no one. You must all be crazy. 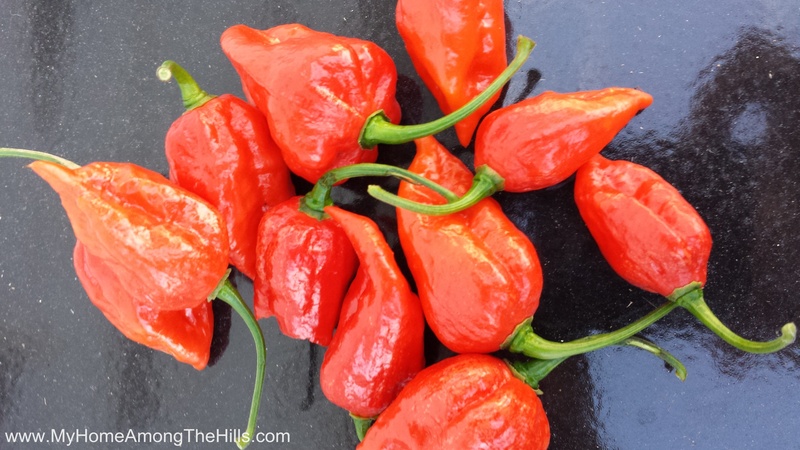 There is a recipe called Habanero Gold. You can make it with Ghost Peppers. I can get about 3 bites before my stomach rebels. Basically my mouth gets the wonderful flavor and my body loves the flavor until the tiny bits of pepper actually hit my stomach. But those peppers have a lovely smokey flavor so it’s worth it. I’m trying to figure out how to get that good smokey flavor without quite so much heat punch. Until then I’ll enjoy my jelly, three bites at a time. Not to get too graphic but the hardest part about eating hot peppers that hot is the next day when they come out again. There is a gas station along I-90 in western Minnesota whose attendant will never look at me the same due to my howling in the restroom. Hopefully since yours came out the way they went in, you didn’t get that experience. Been in too many of those He-Man tests, I’m now too old and refuse to burn my orifices for the pleasure of anyone except myself anymore. Tell Issac to enjoy his youthful games and to try roasting those peppers a little to make them even hotter by driving the water out of them. Also salt helps remove the burn. Oooh. Brother. I cannot even handle looking at the pictures. 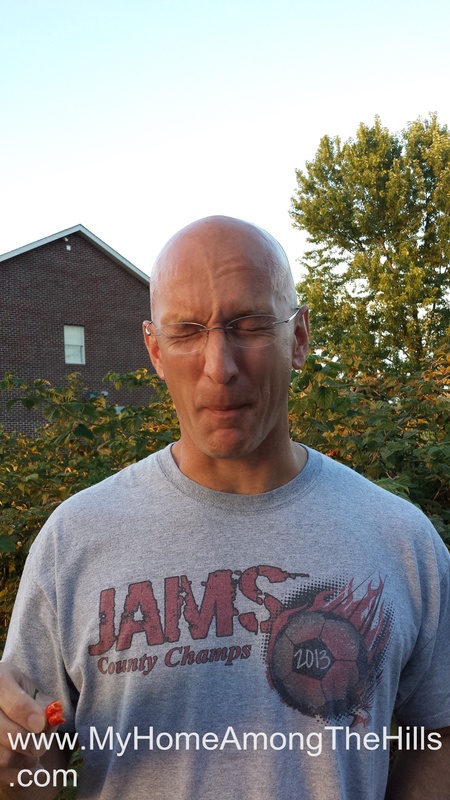 I am reliving the day when Alex was offered a “free burrito if you try this pepper.” Everything moved in slow motion, like a nightmare, and before I could caution him, Alex popped an entire Trinidad Scorpion pepper into his mouth. “2.5 times hotter than the ghost pepper.” All color left his face, his hands went cold. The manager ran out with cheese and sour cream, and implored “Please don’t sue me! I can’t believe he ate the whole thing!” Alex threw the cheese at his mouth. He looked astonished, afraid, so pained he could not stand. I wish he could have vomited. I almost did. It took days to recover, and a lot of milk. He says it was delicious, but yeah probably a ‘stupid thing…’ even for a free burrito! Hope you have recovered ! You two are braver than me. I love spicy foods and peppers but I am scared of the ghost pepper.